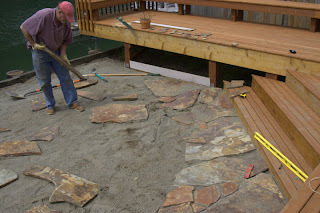 Well, I thought that moving the sand around was hard - playing jigsaw puzzle with 100+ pound stones is another story! No wonder it is called crazy paving! 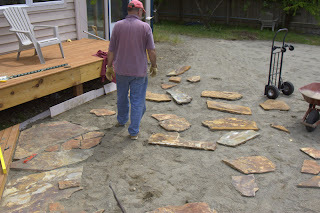 We hauled out the biggest pieces and attempted to line them up along the steps - partial success. But there just seem to be so many tiny triangles to fill. We set the big pieces into the sand, lifting and adding and subtracting sand to level them. That was the easy part. 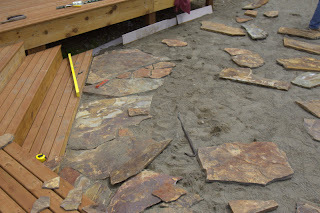 Then we had to start building out and it just seemed the stones are not the right shape. So we ended up uncrating a lot, carrying or using the dolly to bring them around and laying them out o n the sand. It was easier when there were more pieces to play with. But even so, by 5 this afternoon, we were both beat. I took a nice, long lavender-scented bath with a glass of wine for company - you should have seen the color of the water when I got out - ick!!!! So tomorrow we tackle it again, and I think it will be easier, as we are placing the stones and will go back and set them. No mistakes. 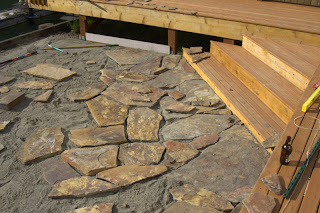 But it's beautiful stone, so I think that no matter what we do, it is going to look gorgeous!